I almost feel the need to apologise for this article before I go any further. So many words have been written on the subject of cork and its problems over recent years, that many wine lovers must feel confused and perhaps slightly bored with the subject. Never before has this humble natural material come under such intense scrutiny. But with a history for stoppering bottles that stretches back hundreds of years, cork is woven into the very fabric of wine – as crucial to its development as oak barrels, glass bottles, or even the grape itself. When cork’s fundamental suitability for the purpose is challenged, developments are worth careful consideration. Cork’s image has taken a bloody battering in the 21st century. First there was the problem of ‘cork taint’ – specifically a mould in cork that can develop into a compound called Trichloroanisol (TCA for short) that can impart a musty, dirty aroma and affect the flavour of wine. Then came the phenomenon of ‘random oxidation’, a lack of consistency that meant one could take a case of 12 bottles sealed with cork, and after a few years the 12 bottles could show huge variability. The culprit was thought to be an inherent variability in cork that allowed differing levels of oxygen ingress.At the same time as this double-whammy of problems was causing genuine concern amongst the wine trade and consumers, new alternatives to cork were hitting the market, most notably synthetic corks made from plastics, and screwcaps made from aluminium. Manufacturers of both were quick to proclaim their advantages over cork – specifically in relation to TCA. A battle of opinions took over the pages of the media, with various commentators taking up ‘pro’ or ‘anti’ positions on cork. Lobby groups soon joined the independent voices in the debate, and the facts became muddied by spin. The cork industry has suffered massively in the past few years. Its share of the market for wine bottle closures has fallen from 95% to around 70% globally. Led by the New World, a significant proportion of wine producers across the globe has abandoned cork. In New Zealand, cork now has only around 30% of the market for bottle closures. Recently, however, doubts have been raised about the alternative closures too. In the 2006 International Wine Challenge in London, a ‘faults diary’ was kept on almost 13,500 bottles that were opened. 7.2% of the wines showed some sort of fault, classified as being closure-related, chemical-related or microbiological-related. TCA was a major culprit, but then so too were oxidation, excessive sulphide levels (‘reduction’) and the unwelcome rogue yeast called Brettanomyces. The conclusion was that whilst the scourge of TCA was almost entirely a problem for cork, other faults were prevalent in wines closed with its alternatives. In the early days of the ‘cork debate’ I kept a very open mind, trying to investigate the true incidence of the problem in articles like this one, published in 1999. But as the millennium passed and problems with cork taint continued to anger and disappoint consumers, I became increasingly impatient with the cork industry’s public response: there was almost a denial that the problem existed, with cork producers seemingly putting more money into PR than research, claiming other faults were being wrongly attributed to cork, criticising other closures, claiming the statistics were all wrong and generally sticking their collective heads in the sand. The one thing we didn’t hear from them was what they were doing to address the problem. 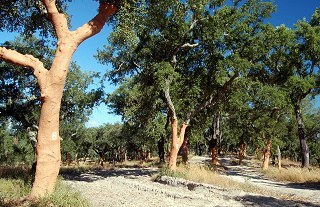 Soon we were driving east from Lisbon into the Alentejo region, the world’s major centre for Quercus suber, the cork oak. Portugal harvests around 50% of the world’s cork, though there are also cork forests in Spain, France, Italy and North Africa. I was here to witness the cork harvest, which takes place from June to August.Trees are not felled to harvest cork, but are stripped of their top layer of bark in an age-old process. The oaks are unique in being the only trees capable of regenerating their bark. The trees are first harvested at around 25 years old, and will then be harvested every nine years, usually by generation after generation of the same family. Over its lifetime a tree will be harvested around 15 – 20 times, yielding the material for up to one million corks. Wandering communities of cork harvesters traverse the Alentejo. These aren’t forests as such, but meadows with widely-spaced groves of trees. The harvesters work in deeply traditional and manual fashion, deftly incising the top inch or two of the bark, and with a few strokes of their axes, stripping off large pieces of bark of uniform thickness. The properties of cork that make it suitable for stoppering bottles have been known for centuries, even though it is only relatively recent science that shows cork has 35 million cells per cubic centimetre, making it light, elastic and impermeable. The traditional process of transforming large sections of bark into corks involved boiling the cork to kill bugs and make it more pliable, grading it visually for imperfections, then simply punching out cylinders to be smoothed and sized for wine bottles. At Amorim this process has been radically re-engineered over the past four or five years, in direct response to the TCA crisis and diminishing public confidence in cork. 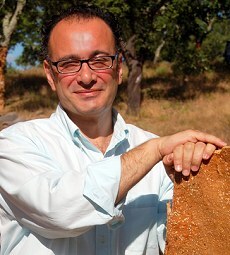 Most other cork producers have acted too, but several of Amorim’s new technologies and processes have been researched and developed by the company. The new approach starts as soon as the cork arrives at one of Amorim’s factories. It is the ‘calcos’, the bottom few inches of the tree where the bark touches the earth, that contains the most pre-cursors of TCA. In the past this would have been processed, but now a team of workers carefully slices every piece of bark to remove it. The boiling process sees the next change. 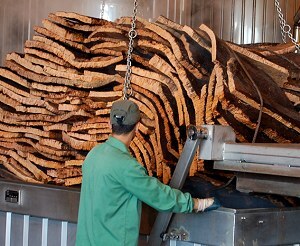 Previously, large presses had held the bundles of cork bark under water as they boiled. But as cork is such a good insulating and waterproofing material, the pressure on the bundles meant some planks of cork near the centre stayed cool, and the temperature was uneven. The way the cork is stacked, and new machinery that suspends loose bundles in the kettles, means cold spots are eliminated. Interestingly, the huge furnaces that provide the boiling water for the three kettles are fuelled entirely by cork dust reclaimed from processing: in fact 56% of all of Amorim’s energy consumption is from burning cork dust and leftovers. The next stage is the inspection of every piece of bark by experienced workers. 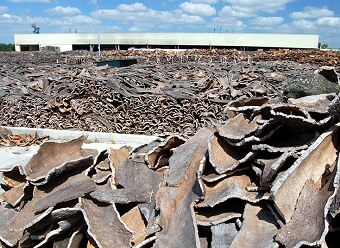 Here again, the process may be deeply traditional, with teams of workers, quietly and efficiently sorting through stacks of bark, slicing off sections or demoting them from bottle-stopper grade, to use in other products like flooring tiles or the soles of sandals. Today’s workers are looking for weaknesses in the cork’s structure, but also for the tell-tale signs of mould. In the centre of the factory floor pieces of cork are placed in the ‘verdura’, or ‘green’ bin, because they show tell-tale signs of mould that could be a pre-cursor to TCA. There’s a barrage of laboratory tests on the cork as it makes its way through the manufacturing process, none of which were applied just a few years ago. 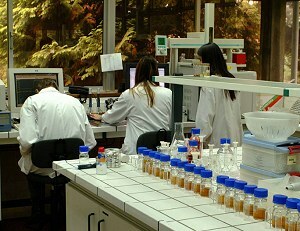 The key test in Amorim’s on-site laboratory (left) – overseen by one of three PhD research leaders, all employed within the past five years – is gas chromatography. Gas chromatographers can detect contaminants like TCA at extremely low concentrations, as low as 0,5 nanograms per litre – or one part in two-trillion. Most scientific experts agree that the sensory threshold for detecting TCA – being able to smell or taste its effect on a wine – is around 2 nanograms per litre, but most people will notice nothing until levels reach 6 to 8 nanograms. Batches which show TCA at detectable levels are subjected to another new process called ‘Rosa’. Named after one of the Amorim family’s daughters, Rosa is a proprietary cork-cleaning process developed after three years of research, that reduces releasable TCA levels in cork by as much as 82%. It works by subjecting cork to a steam distillation, where steam and pressurized water are used to force out volatile trace compounds within cork cells. Independent validation of the process by bodies including the Australian Wine Research Institute and the Geisenheim Research Institute in Germany has proved that Rosa is effective on an industrial scale, and at the time of my visit a second Rosa system was being installed. Even cork which had shown highly detectable levels of TCA at 6 nanograms, can have this reduced to an undetectable 1 nanogram with this technology. Other producers have now introduced their own versions of Rosa. Spending some time with Amorim opens ones eyes to the vastly different types, styles and qualities of cork from which the wine producer may choose. The price of each cork can vary from just a few Euro cents, to over one Euro. The most expensive corks are flawless, elegant single pieces of natural cork. The cheapest are short, stubby agglomerates, made by gluing fragment of ground up cork together. In between are a whole range of options, including ‘twin-tops’, where two discs of natural cork are glued to each end of an agglomerate baton, and ‘technical stoppers’ – specially treated agglomerates. The finest natural corks are the ‘easiest’ to produce: simply punched from a closely-structured, perfectly sound piece of bark, such corks go through the fewest processes. The cheapest agglomerate, on the other hand, may be made from tiny fragments of cork that have been discarded during multiple processes, which then have to be glued, pressed, finished and put through Rosa. 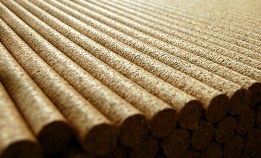 Ironically, these corks which may sell for 1/30th of a natural cork, are the most time and process intensive to produce. At all stages, the corks are being examined by both humans, computer-controlled cameras and other detection devices. Each is looking to determine quality and separate the corks into numerous quality levels, and to eliminate flaws. 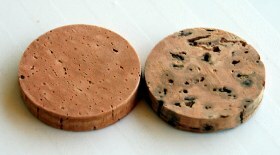 The two discs shown left, for example, are for twin-top closures, but the differences between the grade 2 and grade 5 cork are obvious. Price will determine which one a customer buys, with the most demanding customers paying for ‘mirror finish’, a visually near-perfect surface. The cork industry as a whole has been quick to establish cork’s ‘green’ credentials. Clearly there’s a strategic public relations and marketing message here, in the face of cork’s recent bad press. But to dismiss the claims as PR spin, would be totally unfair. Carlos de Jesus, with his background as a Wall Street city slicker, says “Any serious, forward thinking business today doesn’t have one bottom line, it has three. Financial performance is no longer enough: we need to concentrate just as much on our social performance and environmental performance.” Whilst in the cork forests he explained that Amorim takes the ‘chain of custody’ for its end product seriously: since 2005 their operation has had Forest Stewardship Council (FSC) accreditation, and more and more of their individual cork farmers are gaining accreditation with Amorim’s support. It is hard to argue that aluminium or plastic has the green credentials of cork. A simple way to look at it? Would you rather live beside a cork forest, a bauxite mine (the raw material of aluminium) or a plastics factory? Amorim points out that the cork forests are ‘carbon sinks’, suggesting 1,000 stoppers off-set 118gms of carbon, which is around half the 250gms of greenhouse gasses released in the manufacture of 1,000 bottles. They estimate the global cork harvesting cycle of nine years causes 90 million tons of C02 retention. My final afternoon was spent with Dr Paulo Lopes, oenologist and PhD member of Amorim’s Research & Development team. Paulo’s detailed scientific explanations of all the changes Amorim has made in the last five years, from replacing wooden pallets with metal, to grading their factory storage areas in cement so that rain-water runs away, to packaging finished sacks of cork with a squirt of sulphur dioxide, are very convincing arguments that perceptible TCA has been drastically reduced, if not eliminated at Amorim. He also showed evidence that TCA problems have reduced by over 75% since 2001 for the entire cork industry. On the subject of oxygen transmission, Paulo explained his research in conjunction with the University of Bordeaux. It suggests that bottles sealed with cork do transmit oxygen to wine, but there is no ingress of external oxygen: 90% of cork’s structure is air, so cork itself is responsible for transmission to the wine. Screwcaps, on the other hand, are basically impermeable and run a risk of ‘reduction’ (sulphide problems), whilst synthetic closures allow ingress of atmospheric oxygen, failing to maintain their seal over time. Dr Lopes’s hypothesis is that cork is the best ‘balanced’ of the closure materials, and given careful quality control in manufacture, does not allow atmospheric ingress or high variability. So is cork now the perfect closure? Well, I guess the cork-meisters of Amorim would say Yes to that, but of course the conclusions in such a complex argument are rarely black and white. Everyone I met at Amorim, from President António Amorim, to the workers in the cork forests, seemed absolutely committed to ensuring the quality of their product and sustainability of the industry. The effort – and the financial investment – made by Amorim in researching and developing better preventative measures and production techniques to eliminate TCA and improve cork quality are undeniably impressive. Since around 2004 or 2005 your chances of finding a bottle of wine that is tainted with TCA from the cork are hugely reduced. But they are not entirely eliminated: amongst the cork producers are smaller companies, less able or perhaps less willing, to invest in the procedures, training and equipment that has transformed the quality of Amorim’s corks. Until the entire industry is on board, from forest to bottling line, the possibility of taint remains. The alternative closures are improving too, and a simple equation that screwcap=reductive is no longer true: winemakers are learning more about the use of sulphur when bottling under screwcap, and the screwcap manufacturers are developing caps and liners that can allow controlled ingress of oxygen to minimise the problem. “Market share has fallen from 95% to 72%,” Carlos de Jesus reminds me, “We’ve paid the price for our past mistakes.” And that is the crux of the matter: the cork industry was slow, and some would say stupid, in taking the intransigent position it did on cork’s problems. But companies like Amorim have now acted and acted decisively. Cork is much cleaner, much better, and much more reliable than it was just five or six years ago. I am quite happy to continue buying my New Zealand Sauvignon Blanc under screwcap. But what I saw in Portugal – and the evidence of my own nose and palate that corked wines are increasingly rare in recent vintages – has restored my confidence in cork as a reliable and sympathetic closure for wines, that has stood the test of time. The battle for the cork industry now, is to win back the hearts and minds of disenfranchised trade and consumers. There is something intrinsically ‘right’ about drawing the cork from a bottle of fine wine. It is part of the ritual, and part of the magic. Finally, companies like Amorim have acted, and are doing their bit to restore that magic. The rest is up to us.